For the past several years, we have offered our mobile screen services for a very special event. This is the Patriot Ride, a motorcycle ride and full day of events honoring our veterans and service members. This will be the 13th annual year for the event, held at the Anoka County Airport in Blaine, Minnesota. We are proud to support this event every year at a discounted rate to support our veterans. The LED video wall has becoma an important part of the event over the years. Before and after the ride starts, there is series of activities and vendors centered around a main stage. With the screen, we are able to display a live video feed of the action of the grounds so everyone can see. 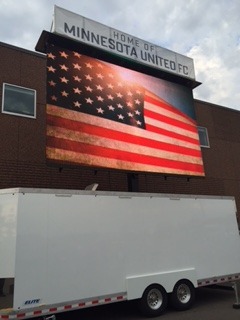 The Jumbotron also displays event information and sponsor ads in order to raise more money to help veterans. Our video screen is also used to show other videos that help honor our veterans. Without the big screen TV, they wouldn’t have been able to properly convey the intended messages. With the videos on screen accompanying what was happening on stage, it made for a very special, and moving moment. 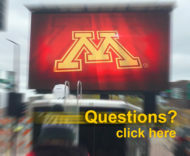 Fire Up Video provides LED video screen rentals for events all over the Midwest, including states such as Ohio, Indiana, Tennessee, Kentucky, Iowa, Michigan, Illinois, Wisconsin, Minnesota, North Dakota, South Dakota, Colorado, Nebraska, Kansas, Missouri, and more. For more information or to rent a screen for your event, please contact us at 844-533-8848 or baum3@earthlink.net.